This was my fifth time racing in Des Moines, but this race experience was very different from years past. The previous four years were ITU draft-legal format verses this year being a non-drafting showcase. 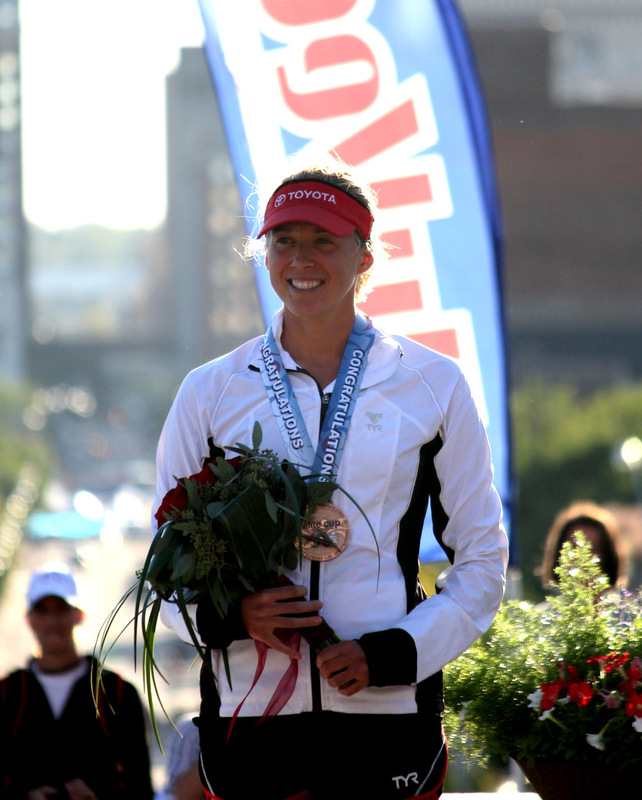 The race was moved back to downtown (where it was back in 2007) and the swim venue was changed from Gray’s Lake to the Des Moines River so that it was very spectator friendly. The course was originally a two lap swim, just short of a four lap bike and a four lap run. There were two different transitions (T1 by the river, T2 by the capitol). Sunday morning ended up being a cool, windy, beautiful day (much like Chicago last weekend). The river had a higher than average current, so the swim course was changed to a three lap swim so that the athletes did not have to swim against the current for too long. I have to say this was the craziest swim ever!!! The swim buoy was moved up to 30meters from the start of the pontoon. So, 30 women were diving off the pontoon and headed into a current, trying to all turn left around a swim buoy. My start position was in the middle of the pack, middle of the pontoon with #17 ranking. Once I hit the water, bodies were on top of me. I had to basically stop swimming and just fight my way around the first two buoys. I was able to make up ground on the first lap, move up into third position as I dove back into the water for the second lap. 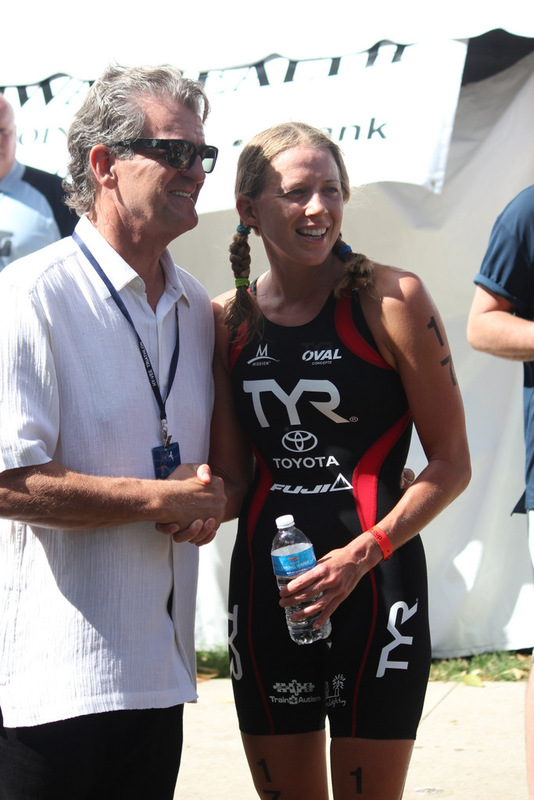 I was just behind Sara McLarty, but on the second lap I got stuck on the second buoy in the current. I realized you had to aim far above the buoy in order to get around the buoy!! The remainder of the swim, I maintained my 15 sec gap back from Sara and focused of keeping the pace high, not running into walls or buoys and ready for a fast bike. Looking back over the splits, it is unfortunate the swim ended up being a little short as the race came down pretty close to the wire and I would have like having the full 1500meter swim verses a 1200meter swim, but that’s all part of the game!! The swim exit was a 100meter run, mostly up steps to T1. I got on the bike and pushed it from the start. I had a ten second gap on Sara McLarty and was able to close the gap five minutes into the bike. Although the bike was non drafting, it had an ITU draft legal feel since course was looped and included quite a few technical sections. Once I passed Sara, I pushed the bike, not only to have the best race possible, but each lap leading, I earned a $5150.00 prime! As the bike went on, I seemed to be maintaining a 40 sec gap I had over Lisa Norden. Towards the end of the bike, the wind was getting very gusty and I had to get out of aero position a few times to maintain control of my bike. With five minutes to go on the bike, I let off the gas getting my shoes off and let my lead shrunk down to 20 seconds over Lisa. 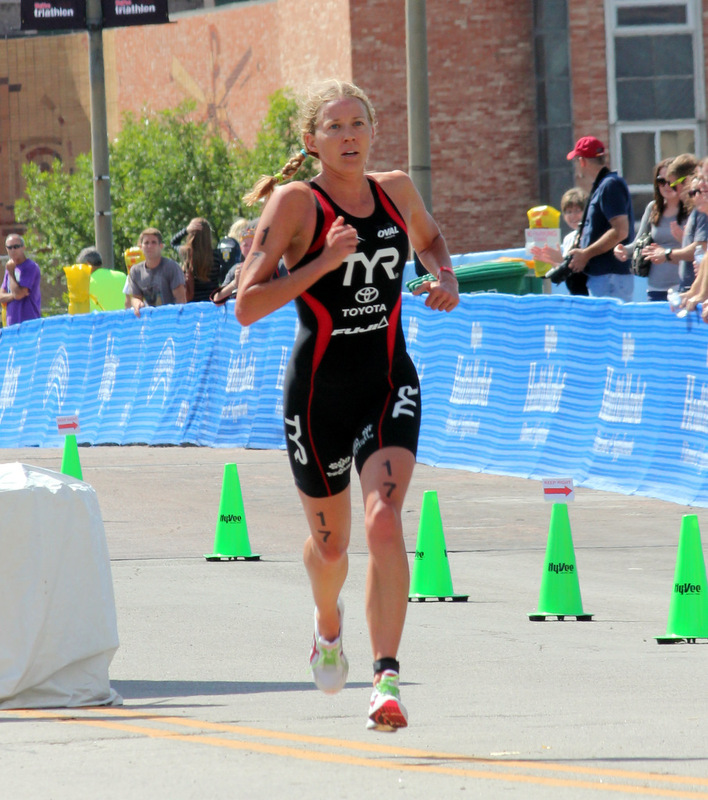 Nicki Butterfield flew past me heading into transition, earning the fourth bike lap prime. I did not even know how close she was the last few minutes heading into T2. As a former pro cyclist, she is extremely good on the technical riding portions of the course and was far superior to me. This is definitely something I need to continue to work on as technical skills were just as important as raw power during this bike. I got my shoes on as fast as I could and was thinking about getting out on the run. I was able to pass Nikki by 1k into the run and was able to grab the next three run primes. The energy from the crowd was invigorating! It was so great to see a city getting together and cheering for all the athletes. I don’t know if I have ever used so much mental energy during a race; between the technical sections on the bike , (and unfortunately, having to swerve out of people crossing in front of me on the bike), to the run. I really remember just thinking about going, staying focused and knowing splits. By the third lap, I knew Lisa was close behind me and it was going to be tough, especially because she has great finishing speed. As I made the last turn, I saw Miranda, and she looked like she was running fast. But, I honestly had not heard any splits about her before? About 500meters down the road, Lisa caught me and just sat on my back into the wind. I surged on her trying to get her off my shoulders, but she responded and seemed to be just comfortable sitting on me and kicking into the finish. Nate mentioned that Miranda was coming and Lisa took off like a bolt. Miranda came by me with about 400meters to go (just before the big hill to the finish). I ran as hard as I could to the finish and ended up with the last podium spot. It was a bit gut wrenching to be leading most of the bike/run and end up third, but I gave it 100%. That’s all I can ask of myself. Miranda and Lisa had amazing performances and I hope to be back next year! Hy-Vee did an incredible job putting on a fantastic event. It is wonderful to see Hy-Vee and the city of Des Moines getting behind the event and supporting all the athletes. I had so much support from friends and family this weekend. Thank you for all the cheers and looking forward to continue to finish up my season on a positive note and giving it my all the finish line. Next up….Dallas Race to the Toyota Cup Finale!